Perfect Sound Forever: Duplicate Albums or Frauds? Hello, collector of vintage vinyl! You know your 1970 first pressing of the Beatles' Let It Be, with the gatefold cover and the red Apple Records apple on the label--that lovely item you lucked into at a secondhand shop, a record fair, or online? Take a closer look. Just how pale is George on the front cover? How shiny is the apple? How neat is the little triangle stamped into the runout grooves, the space between the music and the label? That is, does the triangle appear to have been mechanically stamped, or was it hand-etched? You might want to get a magnifying glass and take a closer look before you make any claims about the record's authenticity, because that edition of Let It Be has been frequently counterfeited. Not the eBay seller who--I'm pretty sure, judging from the photos--posted a fake in January 2015, when I was looking for a copy to replace my scratched original. And my original is an original, with the slightly rosy George, the bright and shiny red apple, the stamped triangle rather than the hand-inscribed one, and the famous "Phil + Ronnie" inscription in the run-out groove. I bought that record new over thirty years ago, and the label on my copy is much more vibrant than the one on the eBay seller's pristine copy. So I passed on the replacement, and I'm continuing to live with my scratched original, which turns out to be more of a collectable than I'd realized. God and the devil, those conjoined twins, are in the details. Keep your eyes and ears peeled in this magical but perilous analog world, my friend. Counterfeit records aren't bootlegs. Whereas bootlegs are unreleased recordings put into new packages, counterfeits are duplications of released items, with varying degrees of precision. The digital age brought about the easy counterfeiting of CD's and DVD's, but here we're considering a more endangered species: counterfeit versions of good old vinyl records. Now that vinyl is "back," counterfeiters produce fake copies of, for example, Led Zeppelin and Pink Floyd LP's and collectable punk singles. They dupe unsuspecting buyers into forking over real money. In addition, some supposedly legitimate reissue labels--purveyors of 180 gram vinyl--have acquired bad reputations by 1) not always exercising proper quality control, so their products are sonically inferior, 2) probably basing some of their pressings not on the analog masters but on CD's or even MP3's, and 3) possibly not acquiring proper permission from the rights holders. Criminality is involved in some of these releases, but the merchandise has at least the aura of legitimacy. That is, I've never heard of anyone buying what appears to be a Led Zep or Floyd record and receiving, say, a jacket without a record in it, or a slab of vinyl without grooves or with grooves that produce only noise. You pay your money and you receive music, even if it's not of the proper quality. An unsuspecting listener can live with a counterfeit record without suspecting its bogusness. Around 1993, I learned that I'd owned some counterfeit records for at least a decade, probably longer. Wanting to make a little cash on what I thought were legitimate copies of rarities by John Lennon and Badfinger, I placed a classified ad in the record collector magazine Goldmine. I'd bought the albums in record stores on Long Island during the late '70's or early '80's, they were the only copies I'd ever seen, and I had no reason to think they were faux. 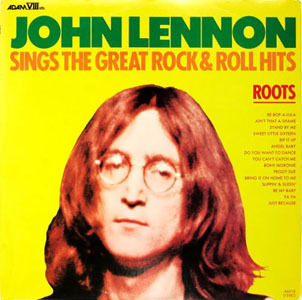 The Lennon album was Roots: John Lennon Sings the Great Rock & Roll Hits (1975), one of the most curious items in his solo catalog. It was released, briefly, by the discount record label Adam VIII after Lennon gave the label's owner a rough mix of Rock ‘n' Roll, Lennon's oldies-covers collection, which was due to be released on Apple. Lennon sued Adam VIII, arguing that he hadn't authorized Roots and that its poor fidelity and worse artwork were harming his reputation. He won the suit, and Roots vanished. When I found my copy, in a store where I'd bought many Beatles bootlegs, I hesitated to buy it only because I doubted I'd ever listen to it. Rock ‘n' Roll has many great tracks, but it suffices, and one Beatles book compared the sound quality of Roots to that of a cardboard box. Yes, the album included one otherwise unreleased track, a cover of Rosie and the Originals' "Angel Baby," but did I really need that? More important, did I really need to own what were then all the nonbootleg Lennon albums? Didn't owning all but one of them--including Lennon and Yoko Ono's early collaborations Two Virgins, Life with the Lions, and The Wedding Album--suffice? The record store owner raised his eyebrows and shrugged. He wouldn't have any trouble finding a home for this rarity. Once I got back home, I decided I couldn't pass up the chance to complete my Lennon collection, so I called the store, and the owner put this pristine copy of Roots aside for me. By 1993, when I was ready to sell the album, I'd become aware of counterfeiting. Not wanting to misrepresent my copy, I phoned the store where I bought it. I tried but failed to jog the owner's memory about me and the record. Ultimately, he said something like "Sure, it's the real thing," but I knew he was covering himself. I hadn't visited the store since the '80s, and he might still have been selling bootlegs, which sometimes prompt police action--even FBI involvement if the authorities want to trace the source of the pirated material. My Goldmine ad brought in a few responses, and I ended up on the phone with a potential buyer. "How do you know it's legitimate?" he asked about Roots. "The store owner told me," I answered. "The store owner told you?" he replied incredulously. He led me through the details in a book that guided record collectors on sorting real Beatles rarities from fakes, and after examining only a few specifics, we knew I was holding a dupe. The Adam VIII label on the record proved nothing! The fact that the music sounded like I imagined it was supposed to--like Rock ‘n' Roll plus a leaden "Angel Baby," with slightly different mixes and all the presence of a cardboard box--meant nothing. "You've played it?" the potential buyer asked incredulously, as though everyone knew you bought rarities to own, maybe look at, and not hear. Yes, I'd played it, and nothing about it seemed wrong. Someone had used a good copy of Roots to create this simulation. The Badfinger rarity--Maybe Tomorrow, by the band in its original incarnation, the Iveys--was even easier for the potential buyer and me to dismiss, because the counterfeiters hadn't bothered to duplicate the apple on the label. Instead, the company's name, the band's name, and the song titles were listed in white on a black label. Since this 1969 LP had been released only in Japan, West Germany, and Italy, I'd always guessed it never bore the label's distinctive fruit image. Hey, when you're a teenager in a record store--not a vintage vinyl store but a purveyor of new product from real record companies, including all the latest hits--and you find a Badfinger rarity in the discount bin, you don't assume you're holding a fabrication. You assume the record collecting gods have blessed you and that the store has no idea what it's selling. I mean, Badfinger isn't exactly a household name. To anyone but a teenage record nerd, who the hell are the Iveys? Why wouldn't a legitimate store sell an Iveys album for $4.98? Even after the potential buyer and I determined that my collector's items were fake, he wanted to buy them. However, he offered a drastically reduced combined price that wasn't worth my time and effort. As I write this, an eBay seller is hawking that same counterfeit version of the Iveys album as the real thing, an "Italian Apple IMPORT LP NEAR MINT In Shrink" for $149.99. If anyone reading this article wants to offer me anywhere close to $149.99 for either that album or my fake Roots, I'll consider the offer! In 2015, I found out that two more of my Beatles-related collector's items were fake. My discovery happened, as so much trouble does, with an idle afternoon spent browsing on eBay. I saw hundreds of dollars being bid on a copy of The Beatles' Christmas Album, a prized rarity that I've owned since a lucky day in 1978. The eBay seller listed details that proved the authenticity of his copy, and I decided to vet my own. 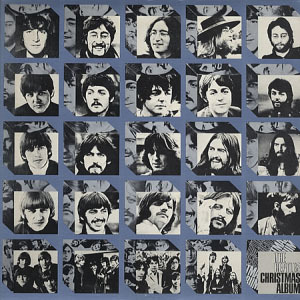 If you own The Beatles' Christmas Album, check the photo in the lower left corner. If one of Ringo's eyeballs is covered by a large shadow, you have a fake. However, the counterfeiters corrected that error on subsequent versions, so visible eyeballs alone don't prove your copy's legitimacy. You also have to be able to make out the words above Paul and John's heads in the photo next to that one. Finally, you have to check--get this--the diameter of the pressing stamp, the circular indentation, on the label. If the stamp is too wide, you have a fake. Until encountering the details on eBay, I was only vaguely aware that records had pressing stamps on their labels, and I had no idea they related to a record's pressing plant provenance. Then my Christmas Album failed all the tests, as did Two Virgins. Who knew? But also, who cared? Maybe the counterfeiters' impulse was to make big bucks on their fakes, and maybe other copies brought in those bucks. Mine certainly didn't; those copies cost about as much as I'd ever been willing to spend on records--not that much, especially when the records weren't guaranteed to provide exciting, beautiful, or even fun music. I never expected to retire on my profits from selling the records, and I'm glad to own them. They're part of my story, and they're part of my record collection as a representation of that story. Who was I? I was the guy who bought fake copies of The Beatles' Christmas Album and Two Virgins on the same day--when I was thirteen and my parents drove me to the other county of Long Island, to a store that answered "yes" when I phoned and asked if they had copies of those rarities. Those two aren't for sale, not even for $149.99. I know the exact day I bought The Beatles' Christmas Album and Two Virgins (November 12, 1978) because that store, unlike any other store I've ever bought records in, stamped the date on the back of each jacket. They stamped the date on the back of the jacket of what was supposed to be a collector's item! The store is long gone, so I can't ask what the owners were thinking. As appalled as I was to find those stamps on the records when I got home, I now find them charming. They make those albums unique artifacts, whether or not the artifacts are genuine Apple Records releases. I've long loved the Christmas Album--a hilarious compilation of the recordings the Beatles made over the years for their fan club--and I've even enjoyed the sound effects that take up both sides of Two Virgins. I wouldn't appreciate those albums more if they were genuine. And the counterfeiters did such a fine job of faking them--even down to reproducing the small marks in the run-out grooves, even wrapping Two Virgins in a reproduction of the brown wrapper used to hide John and Yoko's naked bodies on the cover--that if it hadn't been for the Internet, especially the diligence of bloggers, I'd never have suspected the records' illegitimacy. Why do the people responsible for such counterfeits pay close attention to the details, to make their wares so approximately real? It's not as though they have reputations to uphold. In cases like these, a collector mentality seems to be at work, not just the desire to take the money and run. Maybe, on some level, the counterfeiters want to share rare material with maniacs such as myself. Whatever their motives, the counterfeiters enabled me to experience items I'd never have owned otherwise. I feel the same way about (what turns out to be) my counterfeit copy of Graham Parker and the Rumours' legendary, promotional-only Live at Marble Arch (1976). I bought that lovely, excellent-sounding fake for a few euros at a Berlin street fair about forty years after the initial release. It's the only copy I've ever seen, and I hereby thank whoever made it. Every album is a duplicate. It's an approximation of a master, which is an approximation of what was actually recorded. My counterfeits are duplicates of duplicates. No harm, no foul, as long as I'm honest about what they are. The Iveys' Maybe Tomorrow has its moments, most of which were included on Badfinger's "second debut," Magic Christian Music, 1970. But a counterfeit copy of Maybe Tomorrow, and the fact that it exists because someone went to the trouble to make it, may be more interesting than the real thing. KURT WILDERMUTH's previous look at record collecting, "Black Vinyl: Confessions of a Music Collector" (http://www.popmatters.com/feature/176475-black-vinyl-confessions-of-a-music-collector/), was cited in a message board called "Is This the Worst Music Article Ever Written?" Interested in more information on Kurt's writing and artwork? Please visit www.kurtwildermuth.com.